Happy New Year everyone! CUB is ready for the new year and busy scheduling events for 2018. 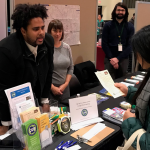 We already have a full January calendar (see upcoming public events here), and it’s never too early to talk with us about inviting us to your area. Utility Bill Clinics. CUB staff can be available at a convenient location during a set period of time to provide free, 20-minute, one-on-one consultations. For example, we might be at a senior center from 9:00 AM-11:00 AM on a Tuesday or a workplace from 11:00 AM-1:00 PM on a Wednesday. 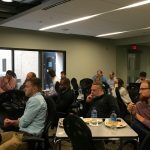 Attendees bring their gas and electric bills and leave with customized ideas to save energy and money, get renewable power, or resolve bill concerns. Tabling. 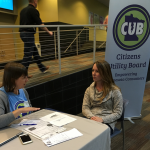 CUB staff are available to share consumer information at fairs, business functions, and community events. We can answer questions about energy-related matters, and we’ll often run a Bill Clinic while we’re there. Don’t be shy about requesting our services — that’s why we are here! If you have something else in mind, don’t hesitate to ask. By the way, with Earth Day on April 22, April will be an especially busy month for CUB. Even though we’re in the middle of winter, please get in touch with us sooner than later if you are interested in organizing an environmentally focused event about energy in April. For more information, you can contact me at 651-300-4701, ext. 2, or carmenc@cubminnesota.org.